style insert use BIG-SERT for oversized engine block repair. Universal head bolt kits can be used in any application in size available. A simple tool setup is all that is required. Optional tool 66241604 Alignment Plug for 3/4 holes not included. e.g. Mercedes M10x1.5 compressor engines. NOTE: A good thread repair practice is to always verify each hole depth before drilling. Normally used when a helicoil or coil style insert has failed. 10 inserts of a 30mm length included in M11 & M12 kits. You must determine if the kit will be suitable for your application. GM, Toyota, Honda and Subaru. Universal head bolt kits can be used in any application in size available. A simple tool setup is all that is required. 10 inserts included in each Universal head bolt kit 2 pcs of each size of head alignment dowel. Drill, Tap, Bushing, line pin, Inserts and dowels. note: you must have kit p/n 6602200 tooling to finish repair. 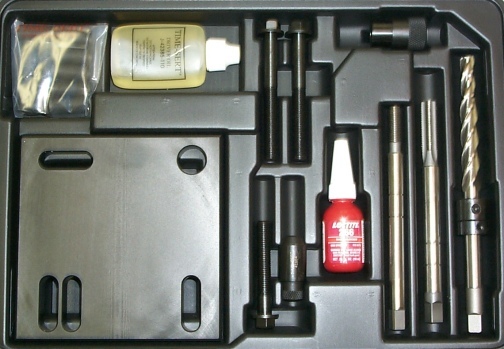 you must have kit p/n 66011125 tooling to finish repair.